Jaswant Thada is a beautiful landmark of Jodhpur attracting many tourists. Carved in white marble, it was built in1899 in the memory of Maharaja Jaswant Singh II by his son Sardar Singh. The Maharaja was very dear to the people of his kingdom as he contributed a lot in improving their life conditions. Fine sheets of marble were used in the construction of Jaswant Thanda. It served as a cremation ground not only for the Maharaja of Jodhpur but also for other members of the royal family. Jaswant Thada houses a beautifully carved cenotaph of the Maharaja which is the main attraction here. Jaswant Thada was built in a temple style by highly skilled artisans of Jodhpur. The multi-tiered garden inside Jaswant Thanda is a perfect place to relax. 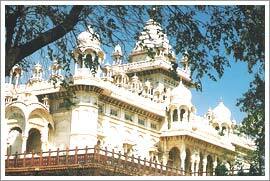 You can visit Jaswant Thada anytime from 9AM to 5 PM. The entry fee is Rs. 5/- for Indians and Rs.10 for Foreigners. Camera is allowed inside but you have to pay a small amount for it.